RTD & Thermocouple Sensors The Trerice Connection Head is available with both Type J and Type K Thermocouples, as well as RTD sensors. 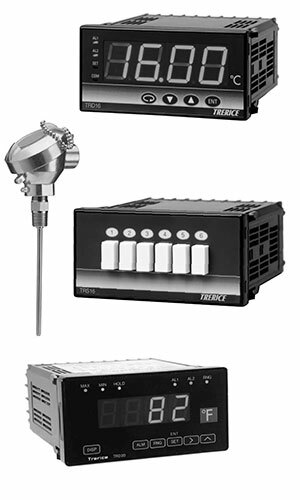 Options & Accessories The Trerice TRT30 Series Loop Powered Temperature Transmitter will convert a thermocouple or RTD signal to a 4-20 mA signal. Digital Temperature Indicator TRD20 Series The Trerice TRD20 Digital Indicator is a superb choice when remote digital indication is required. Indicator Selector Switch TRS16 Series Ideal accompaniment for the Trerice TRD16 Digital Indicator. The TRS16 allows economical measurement of multiple individual processes (using the same thermocouple type) while requiring only one digital indicator. Sensors providing an Electronic Signal to a Controller or Indicating Device.